CANNON BALL, ND – The Bakken Pipeline began quietly, leaving few footprints along its legal trail straight into the U.S. Army Corps of Engineers’ lap. Shortly after the 1,172-mile project was green-lighted, protests erupted in western North Dakota. Arrests and lawsuits, calls for peace and threats of violence followed. On Friday, North Dakota Governor Jack Dalrymple issued an emergency order due to civil unrest, according to Morton County Sheriff’s Department, and Morton County Commissioners extended the declaration on Monday. The protest along the pipeline’s route less than one mile from the Standing Rock Sioux Reservation of North Dakota and South Dakota, started on August 10 when tribesmen blocked an access point for Dakota Access, LLC construction crews, effectively forcing workers to leave the area. A total of thirteen arrests were made, but the activists’ war cry did not change – water and oil do not mix. Within a week the activists’ numbers grew from 200 to more than 2,000 people coming from across the United States and Canada, activists said. On August 15, Dakota Access LLC moved equipment and employees back to the construction route. A hole was cut into a fence, allowing access to more than 50 activists, leading to accounts of broken machinery windows and an assault on a private security worker, according to the Morton County Sheriff’s Department. Activists on horseback charged police, forcing them to retreat from their line, according to Morton County Sheriff’s Department. More arrests were made. As of Monday, a total of 29 activists, including Dave Archambault II, chairman of the Standing Rock Sioux Tribe, or the Hunkpapa Oyate, had been arrested, according to the Morton County Sheriff’s Department. Of those arrested, 26 were charged with disorderly conduct, and three were charged with criminal trespass. All have since been released. A standoff between activists and law enforcement ensued. The outcry against big oil attracted Hollywood movie star Leonardo DiCaprio’s attention, and on August 11 brought Divergent movie series heroine Shailene Woodley to join the protesters. Tensions are brewing. While Archambault calls for peaceful demonstrations, Morton County Sheriff Kyle Kirchmeier fears for safety. Black Land Rovers with tinted windows are parked nearby, watching, activists report. Authorities began investigating two incidents of laser strikes against aircraft conducting surveillance of the protesting encampment, according to Morton County Sheriff’s Department. The strikes allegedly occurred on August 17 and Sunday the 22nd, temporarily blinding one pilot, and are considered a federal crime leading to a fine or imprisonment for up to five years or both. Six miles south of Mandan, State Highway Patrol troopers closed Highway 1806 to traffic. Cellular phone services have been terminated to the area, activists report. Local parks, campgrounds, boat ramps, and fishing areas have been shut down. Work on the pipeline has been halted. Rumors that construction workers had discovered old Native American burial grounds were not verified. “We’re trying to provide a line, a safe line for the pipeline people to enter and to go and do their legal work,” Kirchmeier said. “And they were preparing to throw pipe bombs at our line, M-80s, fireworks, things of that nature to disrupt us. Dalrymple’s declaration of an emergency situation was also prompted by fear. Declaring an emergency situation also allows for the coordinated and effective effort of “appropriate government departments” to minimize the impact of the emergency, according to the executive order issued by Dalrymple. Rumors the National Guard had been called in for support were not verified at press time. Senator Heidi Heitkamp, D-N.D., stressed the importance of protecting the rights of all parties involved, and that she would continue to meet with anyone wanting to discuss the issues. “As North Dakota continues to reduce its reliance on moving crude by rail, producers will keep looking to pipelines as an important part of our energy infrastructure – both for our state and the nation,” Heitkamp said. Dr. Sarah Jumping Eagle was among the first people arrested at the encampment. She was released on bail. Jumping Eagle is a mother of three, and a pediatrician at a hospital in Standing Rock. “It’s very frustrating seeing the actions by the State, they’re the ones escalating this and spreading misinformation,” Jumping Eagle said. “They’re using falsehoods to find ways to escalate their own agenda. “Historically, they would hype up in the newspaper, hype up the local people, hype up the police forces, so that basically the Army could come in. That’s the history of the United States. There is no incentive for them to take it down a notch, there’s a financial incentive to make it appear our camp is potentially violent or threatening. On Monday, the Standing Rock Sioux Tribe and the International Indian Treaty Council appealed to the United Nations for assistance, according to media outlet Indian Country. “We specifically request that the United States Government impose an immediate moratorium on all pipeline construction until the Treaty Rights and Human Rights of the Standing Rock Tribe can be ensured and their free, prior and informed consent is obtained,” Archambault and the Treaty Council said in their petition to the United Nations. Margaret Landin joins the protest traveling from her home in Bismarck every other day. 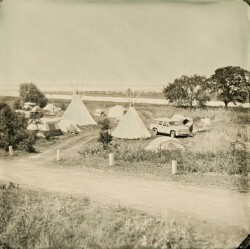 Families with infants, the young and the elderly, Native Americans, and people from all races and cultures have gathered in the Dakota prairie. Citizens are donating food, sleeping bags, outdoor chairs, drinking and washing water, Landin said, and she has not seen or heard of pipe bombs or weapons -- in fact, protest organizers do not allow weapons, drugs, or alcohol onto the encampment grounds, she said. No firearms, no alcohol, and no cameras are allowed, photographer and ambrotypist Shane Balkowitsch said. 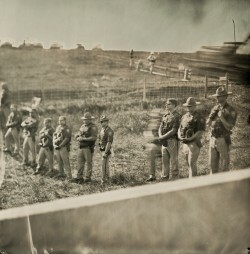 He traveled from Bismarck to photograph the encampment using the wet plate photography technique, a painstaking process where exposures must be quickly developed in an on-scene darkroom. “I saw no weapons, no pushing,” Balkowitsch said. “It was a civil and peaceful protest. They are very adamant, very dedicated to this, obviously, but being dedicated to something is not a bad thing. Longtime activist Winona LaDuke may ride horseback at Stanley Rock, where the thousands camped at Camp of the Sacred Stone are attracting more support every day. Since nearby highways have been blocked, activists are leading supporters into the area on foot. “They’re trying to put the squeeze on this tribe by blocking the highway to their casino and to the protest. And it has backfired on themselves,” Laduke said. The “squeeze” is not working. Laduke spent her birthday at the encampment, among the rolling prairie hills where she could imagine the buffalo that once roamed freely. Nestled against the Missouri River – the mother river – Laduke said it was the best birthday present she could have hoped for. 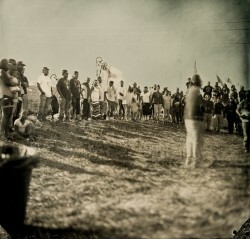 Landin noticed a difference in the protesters, a difference that invokes an ancient prophecy. The Seventh Generation, descendants of those forced into reservations approximately 140 years ago, are supposed to set rights to wrongs, Landin said. The principle is more than legend or prophecy; it is recorded in the Iroquois Great Law of Peace. Besides being involved in the protest, young activists, or protectors as activists call themselves, participated in a relay foot race from western North Dakota to Washington DC, called “Run for Our Water,” earlier in 2016, and then joined protests before the U.S. Supreme Court and the U.S. Army Corps of Engineers. Despite Standing Rock Sioux objections, the Bakken Pipeline, officially known as the Dakota Access Pipeline, began in May 2016, and if finished will snake through the states of North Dakota, South Dakota, Iowa, and Illinois, where it will join up with a second 774-mile pipeline to Nederland, Texas. More than 570,000 barrels of Bakken crude oil will pass through the pipeline per day after it is finished in the third quarter of 2016, according to the U.S. Army Corps of Engineers. The Dakota Access LLC pipeline, which is a joint venture between Enbridge Energy Partners LP and Marathon Petroleum Corporation, would also span 200 water crossings, according to the U.S. Fish and Wildlife Commission, and in North Dakota alone would pass through 33 historical and archeological sites. Initially, the pipeline was to run north of Bismarck, but because it proved to be a potential threat to Bismarck’s wellhead-source water protection areas, the route was cancelled and relocated to its current course, less than a mile from the Standing Rock Sioux Tribe reservation, according to the U.S. Army Corps of Engineers. According to a U.S. Army Corps of Engineers employee, who for the sake of his job wished to remain anonymous, a safe oil pipeline does not exist. Erosion by time, plate tectonics, natural disasters, shoddy workmanship or faulty parts, and cutting corners to fill Big Oil coffers are part of any pipeline recipe. Since 2010, more than 3,300 incidents of crude oil and liquefied natural gas leaks or ruptures have occurred in pipelines within the United States, according to the Center for Effective Government. These incidents have killed 80 people, injured 389, and have caused $2.8 billion in damages, not to mention the lingering effect on humans, and the release of toxic chemicals into soil, waterways, and air. Nearly one third of the spills since 2010 came from pipelines carrying crude oil, as the Dakota Access Pipeline plans to carry. In 2010, the first year after the Keystone pipeline was completed, 35 leaks were discovered, according to Earthjustice, an environmental law organization. In a statement from Archambault on August 16, the chairman of the Standing Rock Sioux Tribe said the issue is not only a Lakota or Dakota issue, but it is a human issue. “I am here to advise anyone that will listen that the Dakota Access Pipeline project is harmful,” Archambault said. “It will not be just harmful to my people but its intent and construction will harm the water in the Missouri River, which is one of the cleanest and safest river tributaries left in the United States. To poison the water is to poison the substance of life. Everything that moves must have water. On July 27, the Standing Rock Sioux Tribe, represented by the Earthjustice environmental law firm, filed a lawsuit in the United States District Court for the District of Columbia against the U.S. Army Corps of Engineers claiming that the project violated the “National Historic Preservation Act” by endangering river waters and by authorizing the construction of the pipeline underneath Lake Oahe, a dammed section of the Missouri River, approximately half a mile upstream from the tribe’s reservation. 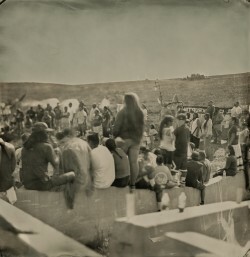 In the lawsuit, the tribe sought an injunction against the U.S. Army Corps of Engineers in addition to a full inspection of compliance, and a declaration that the Corps’ authorizations for the pipeline were in violation of the reservation’s rights according to the two Treaties of Fort Laramie, of 1851 and 1868. The tribe, according to the lawsuit, relies on the lake for drinking water for thousands of people, for irrigation, fishing, recreation, and for cultural and religious practices. “An oil spill from the pipeline into Lake Oahe would cause an economic, public health and welfare, and cultural crisis of the greatest magnitude,” according to lawsuit documents. Fearing bodily injury to Dakota Access LLC employees and contractors, the oil company struck back, filing restraining orders on August 15 and seeking monetary damages against members of the Standing Rock Sioux tribe. Meanwhile, other issues are piling up for Dakota Access LLC. On July 20 Enbridge Energy Partners LLP was ordered by the Justice Department and the EPA to pay $177 million for its responsibility in the 2010 Michigan Tar Sands Spill. Enbridge spent six years and more than one billion dollars in cleanup efforts, but the area was not restored, according to media outlet Bold Nebraska. After spending millions, and wasting years battling for approval of a Bakken crude oil pipeline across Minnesota, Enbridge Energy Partners LLP switched gears, joining with Marathon Petroleum Corporation to run a different pipeline, the Dakota Access Pipeline, through North Dakota, a state that is far less strict about environmental issues than Minnesota. The Minnesota Sandpiper pipeline has been put on the back burner until 2019, according to Enbridge, and analysts predict the project will never be resurrected. In Iowa, where work on the pipeline is underway, three fires erupted causing heavy damage to equipment and causing an estimated $1 million in damages. Investigators suspect arson, according to Jasper County Sheriff John Halferty. Dakota Access LLC personnel did not return telephone calls by press time. Tribal leaders claim the U.S. Army Corps of Engineers did not discuss the pipeline project adequately. “The tribe has never been able to participate meaningfully in assessing the significance of sites that are potentially affected by the project,” the Standing Rock Sioux Tribe lawsuit stated. The Standing Rock Tribal Historic Preservation Office received a generic letter from the U.S. Army Corps of Engineers seeking consultation on February 12, 2015 pertaining to bore hole testing, according to the lawsuit documents. Tribal leaders objected, but received no response until September 16, 2015, when a second letter stated the consultation process ended on January 18, 2015, according to lawsuit documents. Again, tribal leaders objected, demanding joint consultation and a class III survey in conjunction with tribal archeologists. Instead of addressing concerns, the U.S. Army Corps of Engineers’ next step was to publish a draft environmental assessment that did not include a single mention of the potential impacts of the pipeline project to the tribe, according to lawsuit documents. Not until February 2016 did the U.S. Army Corps of Engineers Colonel John Henderson begin discussions with Standing Rock Sioux tribal leaders. Several visits were made, at which point tribal archeologists showed military personnel shards of bone and pottery that had been pushed from the ground by burrowing moles. On April 22, 2016, the U.S. Army Corps of Engineers’ response was to make the formal finding that “no historic properties were affected,” according to lawsuit documents. The U.S. Army Corps of Engineers disagreed, stating that investigators followed procedure. “The Corps conducted formal government-to-government consultation with tribal representative via meetings; site visits; distribution of pertinent information; conference calls, and emails in order to inform tribal governments and private members, and to better understand their concerns. Historically, British and American governments have deceived Native Americans by many means, through trick, by trade, and according to some, with biological warfare. In 1763, a British captain gave smallpox-infested blankets to Ottawa Native American warriors. The account is documented in the journal of William Trent, a local trader who had close dealings with British soldiers. “Out of our regard for them, we gave them two blankets and a handkerchief out of the smallpox hospital. I hope it will have the desired effect,” Trent wrote in his journal on June 24, 1763. An unsubstantiated instance allegedly occurred in June 1837 when the U.S. Army began to dispense trade blankets to Mandan tribal people at Fort Clark along the Missouri River in what is now North Dakota, according to the History News Network. The blankets were said to have come from a military smallpox infirmary in St. Louis, and brought upriver aboard the steamboat St. Peter’s. When the Native Americans showed symptoms of the disease, fort doctors allegedly told them to scatter and seek sanctuary with healthy relatives. No matter how disease was introduced to the Mandan tribe in 1837, more than 100,000 Mandan Native Americans died in the smallpox pandemic between 1836 and 1840, according to historians. 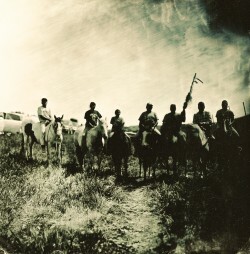 Closer to home, the events from Pine Ridge Reservation in South Dakota during 1890 and the 1970s have further exacerbated mistrust between the U.S. government and the Lakota people. In 1890, Sitting Bull, a holy man and leader of the Lakota, was killed during the Ghost Dance movement at Wounded Knee. Later that year, the U.S. Army’s 7th Cavalry surrounded another band of Ghost Dancers, slaughtering 150 Lakota tribesmen. Additionally, in 1944, the Pick-Sloan Plan for flood control of the Missouri River gave the U.S. Army Corps of Engineers the authority to build 107 dams, effectively forcing the relocation of nearly 1,000 Native American families. Later in 1946, the U.S. Army Corps of Engineers began construction of the Fort Randall Dam in South Dakota, which in turn flooded 22,091 acres of Yankton Sioux land and forced 136 families to move elsewhere. According to online reports when the tribes affected informed the Department of Interior, government officials told them to start looking for new homes. Again, in 1948, the U.S. Army Corps of Engineers began construction of the Oahe Dam, near to the demonstrations against the Dakota Access Pipeline today. The project destroyed 90 percent of the timberland on the Standing Rock Sioux and the Cheyenne River Sioux reservations, and is known by some as the most destructive public works project in U.S. history. In 1959, the U.S. Army Corps of Engineers began work on the Big Bend Dam in South Dakota, on lands belonging to the Crow Creek Sioux and the Lower Brule Sioux. The project took away 21,026 acres of Sioux land, and flooded the town of Lower Brule. In 1960, the U.S. Army Corps of Engineers filed a condemnation suit against the Crow Creek Sioux and the Lower Brule Sioux to obtain the land. The U.S. Army Corps of Engineers was allowed to take title of the land. For more than 130 years in the Black Hills, South Dakota, gold miners, and in recent history the Homestake Mine, poisoned river waters with sulfur, mercury, aluminum, cadmium, copper, iron, selenium, lead, and arsenic, through Native American, private, state, and federal lands, according to a 2005 report filed by the United States Department of Interior, Bureau of Land Management, United States Department of Interior, Fish and Wildlife Services, and the South Dakota Game, Fish and Parks. The aftereffects of a century of gold and lead mining are toxic to flora and fauna, according to the report. Starting in 2005, efforts were being made to restore the areas affected along the Whitewood Creek, the Belle Fourche, and the Cheyenne rivers, and the Homestake Mining Company of California, Inc. ceased mining and production in 2001. Whitewood Creek flows into the Belle Fourche River, which flows into the Cheyenne River, which flows into the Missouri River at Oahe Reservoir, according to the report. 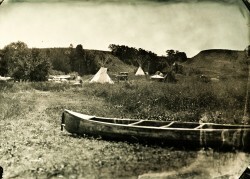 The confiscation, poisoning, and destruction of Native American lands not only forced tribesmen to move, it crippled their way of life, their hunting and fishing grounds, their chance to sow crops on once fertile soil, their spiritual practices pertaining to ancient burial grounds, and further impoverished those living on reservations, government reports and activists said. With such a historical pattern of deception and at times brute force, it is little wonder why Native Americans distrust anything government officials say, activists said. Although Jumping Eagle has charges hovering over her head, she is not daunted. Jumping Eagle, an Oglala Sioux who married into the Standing Rock tribe, lives and works there, and she did not plan on getting arrested. A court date has been set, but she is not daunted. Instead, she plans to create hand-washing stations at the encampment. “This is not something I take lightly. I keep it in mind, but I want to be able to protect the land and water. This is a crucial time. For too long we’ve allowed corporations to be more important than people. The company and the police are protecting the interests of an oil company -- directly violating the rights of people. We’ve already suffered enough. The fact that they want to place the pipe just north of our community, when we are already dealing with so many other issues that could threaten our drinking water -- and put us into a situation like Flint, and people will have to buy water? Is not right. Despite the deck being heavily stacked against her and her family, her tribe, and anyone living near or depending on the Missouri River or its tributaries for sustenance, Jumping Eagle remains hopeful that one day, things will change.